For those of you who, like me, knew nothing of the Musical, and had previously only seen the award-winning British film, then it will come both as a surprise and disappointment to lean that the Musical version is a very watered-down affair and set, not in Sheffield, but Buffalo, USA. Presumably this is because the authors of this Musical, Terrence McNally and David Yazbek are American and thought the US market would be more likely to buy tickets for and relate to something set on their shores rather than in li'l ol' England. That may well be the case, but perversely the opposite also applies, and losing something which to many is a 'national treasure', something akin to Brassed Off, is a travesty; and the grit and spirit of the film has been 'lost in translation'. No matter, it is what it is, and Rochdale Musical Theatre Company took the bull by the horns and gave it their best shot. An amateur company of over 100 years' standing - they were formed in 1898 - and one with a very good reputation for delivering high quality and entertaining shows, they are also showing just exactly how versatile they are. Last year saw them perform the North of England premiere of a new Musical, A Tale Of Two Cities, and in a complete change of mood and pace, this year, the brave choice of this show, The Full Monty. There is still much to like about this Musical version, and some of the heartaches and journeys our protagonists have to go through still do wrench at our heartstrings; but all in all it is much more upbeat than the film. We do still see these six having to go through their moments of self-doubt, their fears, and having to overcome untold obstacles before they finally do perform their sell-out and much-anticipated show. The music is jaunty and catchy, and I found myself tapping my toes along to most of the tunes; although some of them are torturously difficult to sing, demanding great vocal agility from the cast, especially the lead role of Jerry. However, it has been a very long time since I heard a band for an amateur show play so beautifully and so accomplished. Under the tight but excellent direction of Richard Lord they were flawless and superb. Heywood Civic Centre has a very wide stage, and so a portion of this stage right section in front of the tabs was given over to the band, as well as a small pit. The other side, next to the 'pit' were a couple of cabaret tables and seating which were used by the ladies when watching the stripping. The main body of the stage became more or less, everything else, using tabs, cloths, flats and dollies to bring the scenes to life. There was however a space on stage left front of tabs - diametrically opposed to the band - which in the first act was used a couple of times, but it was never entirely clear what the location of this space was. Only in the second act when it was used as Jerry's flat, did it make sense. The six out-of-work steel workers who formed their version of The Chippendales, Hot Metal, were brilliantly cast and they sparked off each other superbly. The driving force behind the show, and the reason for the story, is Jerry - a 30-something father of a young son who lives with his divorced wife and is about to marry her new lover. Giving a truly great performance of this was Phil Swift. His best friend and co-worker Dave, for me was the most empathetic and believable of the sextet, and was played by Mike Wignall, with truth and was a joy to watch. These two are joined along the way by the hated foreman who becomes their dance teacher and eventual ally and friend, Harold, played with a touch of menace but a twinkle in the eye this evening by Steve Royle. Another fellow unemployed steel-worker, now working as a security guard, and so dissatisfied with his simple life that he is trying to commit suicide, is the very insecure, and possibly gay Malcolm, played here with a touch of neurosis and very likeably, by Dan Killeen. The other two to join in the antics are the all-smiling, young, keen and eager Ethan, who as a finale spectacle should have actually done a wall-flip which would have been amazing (but hey...), who was played by the immensely easy-to-watch and personable Josh Gwynne, whilst Marvin Nixon as Noah 'The Horse' made a truly lovely addition to the group. His skills as a performer should not be under-rated. And yes, a split-second before the final blackout, and with an ingenious lighting plot, these six do go the full monty, to not just the whoops and screams of delight from the female cast members, but from the entire audience too. Massive kudos to all of you! Supporting the men on their journey were girlfriends, wives, etc. Most of these characters somehow pale into insignificance in this story and serve only to heighten the narrative not form it. A couple though do deserve a mention here. Jerry's ex-wife Pam (Sarah Croke) was full of vindictive and truculence, but she had a softer side too and their son Nathan, the 13-year old Sean Caffrey played his part extremely well with real truth. However, for me, the best supporting role must surely go to the rehearsal pianist who appears from nowhere and goes on to support and encourage them in her typical Jewish way. Jeanette, played here with a sense of fun and great timing by Joanna Astley. There are a few darker, more reflective moments in the show, and I especially liked You Walk With Me sung by Malcolm at his mother's graveside. In general though this is an uplifting and feel-good show which will warm your heart at the perseverance and beauty of the human spirit. 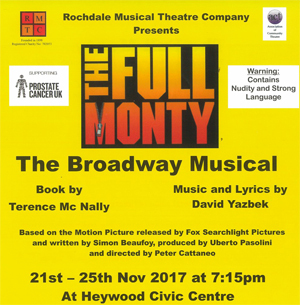 With some genuinely lovely choreography which suited the cast well, this was a daring show to produce, but it certainly shows that Rochdale Musical Theatre Company can turn their hands to anything and make it a huge success! Verdict - a thoroughly enjoyable and highly entertaining evening in the company of a talented society.